Combining more powerful cameras with AI-infused access to a decade's worth of Street View information will provide more precise, easier to read directions. Forget about phones. They’re just the place where Google and others develop features meant for what comes next. And directions aren’t the point either. AR maps could help you learn more about everything you pass. GPS tells Google Maps where I am, then the app tries to match what the camera is seeing with a decade’s worth of Street View data. Google (now has) a three-dimensional map of the world that it can search every time you open. The app even prevents you from using the camera too much. Google is very clear that this feature isn’t for use while driving. 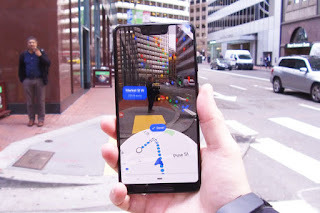 And nifty as it is, the AR feature isn’t even supposed to be the primary way you get around, said Rachel Inman, Google’s user-experience lead on the AR project. It can be helpful in particularly complicated intersections, or when the alley you’re looking for is well-hidden. “It’s for those moments like, ‘I’m getting off the subway, where do I go first?’” she said.The app even prevents you from using the camera too much. If you’re in AR and you lower your phone, the app will flip to the standard map. If you hold it in front of your face too long, it pesters you to put the phone down, eventually darkening the screen. That kind of nagging will help your phone’s battery and data cap—and keep you from wandering into the street—but in the early software I was using, the alerts sometimes got in the way of real navigation. And directions aren’t the sole point either. 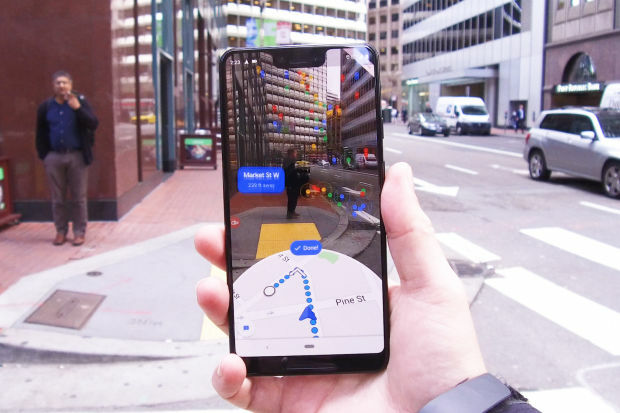 AR maps could help you learn more about everything you pass. Tory Smith, product strategy lead for autonomous vehicles at Mapbox, a navigation startup, envisions a possible future in which your windshield could display the nearest parking garage, then tell you how many spots are open, how much it costs and whether there’s a good coffee shop nearby. You might someday navigate indoors—where GPS doesn’t work—using AR maps, with Google Translate instantly turning every sign you pass into your own language.This is all long-term stuff. Even the new Maps I saw won’t be widely available for a while. It is rolling out soon to a few Local Guides, who are the service’s most dedicated reviewers and users, and will come to everyone only when Google is satisfied that it’s ready. Most of us will have to make do with regular old 2-D maps for a while longer. But pretty soon augmented reality might fix the blue dot once and for all.